We are located at 148 W Philadelphia St, York, PA 17401 (next to Pippi’s Pen Shoppe). Established in 2001 as Walczyk & Young Studios, Vulcania Graphics & Fine Art, LLC is located in the Market District in downtown York, Pennsylvania. We specialize in digital photography, fine art printing and fine art giclée & canvas printing for both local and international artists. Daniel G. Walczyk (d. g. walczyk) and Shawn Young are the resident artists and co-owners of Vulcania Graphics & Fine Art. Learn more about the giclée printing process at Wikipedia. 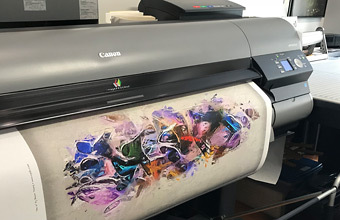 Vulcania Graphics & Fine Art uses a closed-loop color management environment where we create and manage our own paper profiles and monitor calibration profiles. This is the preferred method for producing high quality professional prints. If you would like to use any of our paper profiles for soft proofing your artwork please contact us. Please note that soft proofing on-screen will require a properly calibrated monitor. If you are preparing your own digital files for printing, we recommend the file specifications below. We can also accept jpeg files. Please note that if your digital files do not meet the requirements below, file conversion charges may apply (resizing, cropping, etc.). size: final print size desired measured in inches at 300 ppi. (i.e. 18 in. x 24 in. @ 300 ppi). If you need a white border around your image we can ad the border for you. We can accept files brought in on a compact disc, USB flash drive or Compact Flash card. If you would like to bring files into the studio, please call ahead or email us to schedule an appointment. You can also email your files. If your files are too large to email, we recommend you use a free file-sharing service such as Dropbox and then email us links so we can download your files. We do not have FTP file upload capability. 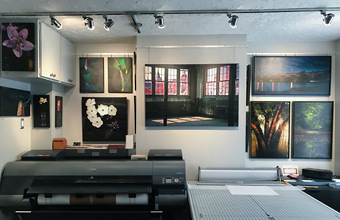 Archival pigment prints (photographic, giclée and canvas) are priced by the square foot and rounded up to the nearest tenth. If borders are needed around the image, include the borders in the final paper size calculation. Example: 16 in. x 22 in. image area with 1 in. borders would have a final print size of 18 in. x 24 in. The square footage for an 18 in. x 24 in. print is 3.0 sqft (18 x 24 ÷ 144 = 3.0 sqft). © 2016 Copyright Vulcania Graphics & Fine Art, LLC. All rights reserved.